The Valley Local: "Mocking Up Fernwood Street" or "A Left-Brainer in a Right-Brained Hobby"
"Mocking Up Fernwood Street" or "A Left-Brainer in a Right-Brained Hobby"
I'll leave for another time a discussion about how many left-brained folks are attracted to this hobby which relies so much on the right-brained/artistic side. How else can you explain all the detailed how-to books on scenery, weathering, painting, etc - some even with actual recipes and formulas (formulae? I'm looking at you Dave Frary, since I own ALL the editions of your scenery guide...)? Rather than a discussion, I'll post an example - taken from my own painful experience in "mocking up" a certain scene in the town of Wethersfield on my layout. Said scene centers around John Wallace's house on Fernwood Street and a little Cape Cod house I imagine across the street. 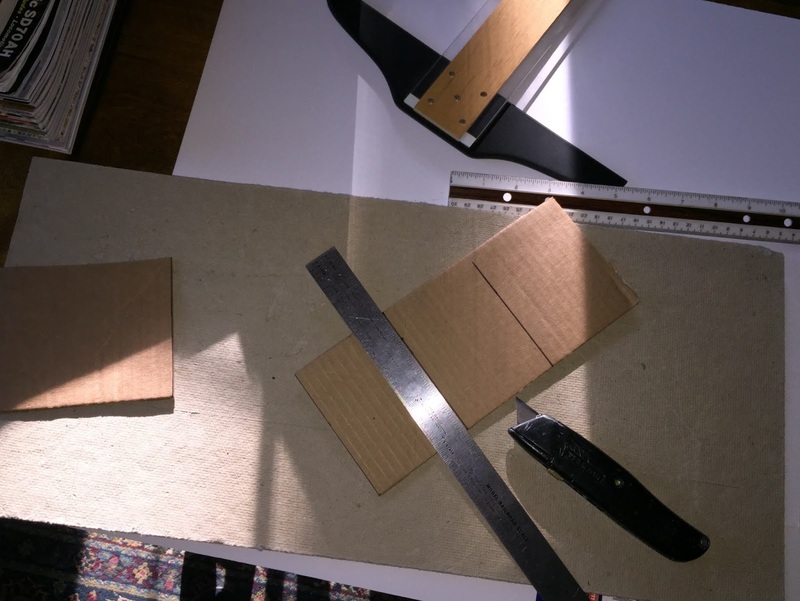 "Mocking up" conjures images of just placing things together to see what looks "right." For me, it meant blowing up Sanborn maps so that I could get the scale to equal something I could measure. That way I figured out that Fernwood St. was 40' wide, the houses were set back 20' from the street, and the footprint of John's house is - approximately - 31' 3" wide and 37' 6" deep. But I'm getting ahead of the "fun" stuff . . . I love maps. Especially Sanborn maps. Look at all that fun detail! Fernwood Street is near the top (north) of the diagram. And here's the area on my layout. The coffee cup is sitting on Jordan Lane and Wethersfield Lumber is in the background, across the tracks. The taped-up paper is the start of a template I'll make of the area. I used scrap paper to mark where to cut to fit in between the track and fascia. And here it is all cut up. This is roughly the area that will be occupied by John's house (which will be to the north/right of Fernwood St.), Fernwood Street itself (in the center) and the little Cape (which will be across the street on the left. I used the paper template as a guide for cutting out a more-substantial/stiffer cardboard equivalent. 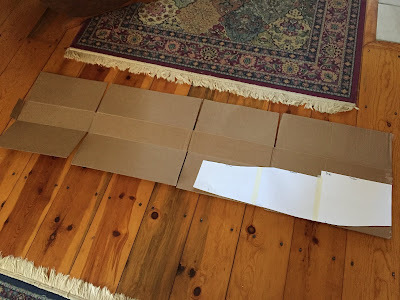 While I had the cardboard out, I put together a mockup of John's house. So, here's the first placement. A photo of John's house is taped to the cardboard mockup, the paper is Fernwood Street, and the Cape is just to the left/south. Looking down the street, you can see better where I've marked on the template where the throwbar is for the house track switch (critical for making sure you can access it easily around the structures). 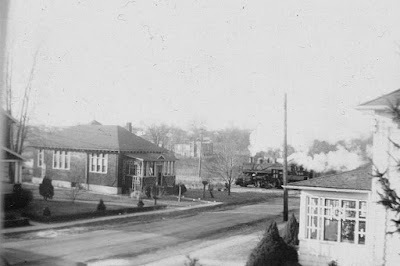 Another view, looking southeast toward Church Street, Wethersfield Station and Gra-Rock. Another aerial view - with everything moved south (to the left) a bit. Of course, moving the scene south starts impinging on the team track scene. Detecting a theme here? I'm obsessing WAY too much over exactly where to put these houses. but it wasn't until I took the above photo that it hit me . . .I'm trying - again, mistakenly - to do a scale/uncompressed scene right in the middle of a layout that has to be compressed. Just take a look at Fernwood Street. It's perfect scale - but way too large for the scene. Here's my nice, scale-sized Ferwood St. template compared to Middlesex Turnpike at Goff Brook. Fernwood St. may be "correct" but it ain't "right." As I said at the top of this post, I may explore this left-brain/right-brain tension in our hobby more some other time. Just recently, during a discussion with my friend Dean Turta (who is doing an amazing job of modeling Cape Cod on his Cape Cod & New Bedford. Sadly, Dean's blogless) he reminded me that I have to get over trying to replicate everything perfectly (a very left-brained thing to do) and, instead, focus on conveying the "look and feel." Now, that way of thinking may not pass muster when it comes to modeling a locomotive. But for scenery, and in this case, structure placement and road width, that decidedly right-brained perspective is exactly what's needed. Sometimes, an impressionist painting conveys a scene better than a photograph ever could. So I think in this case I need to practice a little more of the "art" of model railroading - more impressionism, less photo-journalism. So I need to narrow Fernwood Street. A lot. And - bonus! - I'll get a bit more room for the houses, and the scene as a whole will look and fit better. If I can convey the impression of the scene, that'll be much more effective than trying to shoehorn it in. But for now, all this is making both sides of my brain hurt. I think I'll join Lexy and Rosie by the stove . . .